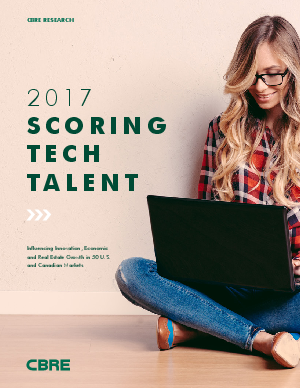 Scoring Tech Talent is a comprehensive analysis of labor market conditions, cost and quality for highly skilled tech workers in the U.S. and Canada. The 50 largest markets were ranked according to their competitive advantages and appeal to tech employers and tech talent. The analysis also provides insight into the quality of tech talent, their demographics and how tech talent growth patterns are impacting cities and real estate markets. Download the report to see the full ranking of the top-50 tech talent markets in the U.S. and Canada. Below, explore the markets using our new Tech Talent Analyzer or sign up for our upcoming webinar.